While we’re always trying to entice people to come into the library, more and more libraries are recognizing and prioritizing getting out of the physical building and into the community. Outreach is such a critical part of what we librarians do, and it is often the best way to reach those who need our services the most. One way some libraries are reaching out to their communities is through their bookmobile. Bookmobiles have existed in the U.S. since the turn of the century, though the original ones were horse drawn carriages. The first motorized bookmobiles launched in 1912. While they started as a way to get books to rural and far flung areas, they have adapted over the years and can be found in all types of communities engaging in a variety of services. Over the years, the popularity of bookmobiles has risen and fallen. There was a decline during both World Wars and the Great Depression. The 1950s and 1960s saw a huge growth, some of which is likely due to the Library Services Act of 1956 as well as additional legislation. While their popularity has fluctuated over the years, you shouldn’t think of them as nostalgic relics from years ago. Bookmobiles are still a part of modern library service in many communities. 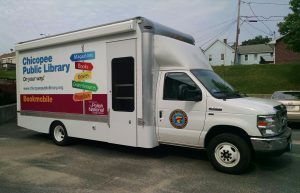 In fact, there are currently six bookmobiles operating in five public libraries in Massachusetts – Beverly, Chicopee, Natick, New Bedford, and Worcester (which has two). In Chicopee, when you can’t get to the library, there’s a way for it to come to you! Since June 2015, the Chicopee Public Library’s Bookmobile has been a significant part of library outreach. The schedule rotates every few months. Right now, the Bookmobile is using a two week rotation, where they make fifteen stops at eleven different sites. Locations include housing complexes, the Boys and Girls Club, and the Senior Center. Warmer months see the addition of parks and the farmers market among the stops. Chicopee’s Bookmobile truly is a library on wheels, offering the typical library services you’d expect in a brick and mortar building. On the Bookmobile, you can check out materials, request items for pick up, access online resources, use a WiFi hot spot, register for a library card, and get on the internet via iPads. If you’re a librarian thinking about getting your own bookmobile, you should know that it can be a large investment in time and money. So, while it’s not something to enter into lightly, many libraries do find it is well worth the effort. And if you’re looking to up your outreach game, it might just be the answer you’re looking for! Valentines are a way we show how much we care. So why not use them as a way to show how much libraries are loved? That’s exactly what the MBLC has done. 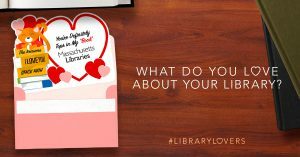 The MBLC’s 3rd annual Library Lovers campaign provides a way for residents to write valentines to their libraries. The MBLC collects the valentines and delivers them to legislators to help them better understand how much residents value libraries. Last year 4,000 valentines were delivered to Massachusetts legislators. Last year we delivered 4,000 valentines to 121 state legislators. More important than the quantity of valentines is what residents say. It’s truly heartfelt (pun intended.) It’s not just that they love their helpful librarians (they do, in droves!) or that there’s amazing books, programs and resources. It’s that libraries play a role in residents’ lives that no one or no other institution can. The Library has been an integral part of my life, for my entire life. I learned how to read in the Children’s Room and wrote my college applications on the computers upstairs. It’s hard not to love the Library’s kind and caring staff, and the love of reading that they share with patrons. Recently, I was able to utilize the Library in a new fashion-- professional research. My local library is very small but its benefit to the community is enormous. The library is very important to me. I work from home and am very isolated. Our town is rural, so I don’t get to see a lot of people. The library has been so helpful in getting me out into my community, learning what is going on within it, meeting other residents, and creating a social civic life that I feel fully engaged in. The library is the only place I’ve always belonged, no matter what. My library supported me! I emailed them with an idea to start an environmental themed book club, and they helped me brainstorm which books we should choose for the program, took care of all the advertising and scheduling, and now I have this awesome book club to look forward to every month! I get to meet people in my community who care about the same things I do too. As a recent college graduate, finding ways to connect with my community after being away for 4 years is really important to me. I’m so happy I was able to continue learning new things with other like-minded people at my local library! The Perkins Library has served me throughout my entire life. First as a student at Perkins, and then as a wife mother and homemaker. And the books that were made available to me, and all of the subjects pertaining to the occupation in my life then, were of invaluable help. Later on, my work in community theater benefited from the Library's wide selection of helpful material. But, when I became a caregiver to my daughter during her long battle against Glioblastoma brain cancer, the constant flow of books from my beloved library provided me with the information about the disease, escape, and sometimes humor which I needed to get through those impossible twelve years. Now, Perkins Library still walks beside me through sleepless nights and empty days, helping me get through my grief. Perkins Library has done what even well-meaning friends could not do and I shall be forever grateful. I love you Perkins Library! Listening to recorded books I've received from the Perkins Talking Book Library it is a lifeline for me, it allows me to be connected to the world, to learn, to be entertained, to feel companionship. It gives meaning and hope for me. Thank you so much. My library helps to make my retirement years meaningful. Perkins Library became part of my life 18 years ago. It's right up there with the air I breathe. My library opens up my world. It allows me to travel to new places, to meet new people, to cook new foods, and to hear new music all with one little card (and without spending a dime). I am forever grateful for the resources available and the friendly staff that make these experiences possible. This is TRUE LOVE! Love the opportunities to meet with other teens and play Minecraft! What a great group. Thank you Library. Dear Library, I loved you but I left you... I want you back! I miss you so much! Here in Maine there’s no SAILS network, no New Release DVD’s, no amazing Juvenile DVD’s, no coupon sharing, no dropping off items at any network library location ...You don’t know what you’ve got ‘til it’s gone! Please support our libraries - they are an essential continuing education resource and invaluable to those who do not have access to a computer at home, especially those who are looking for work. I love the staff and the access to such a wide variety of resources through the consortium. It’s so good to see all these institutions working together. I’ve lived lots of places and no other state or commonwealth does this as well. I was even able to take grad classes in history at Harvard without spending a fortune on books because of interlibrary loans. Please keep them funded! I love my library because it still can instill a love of reading in children. 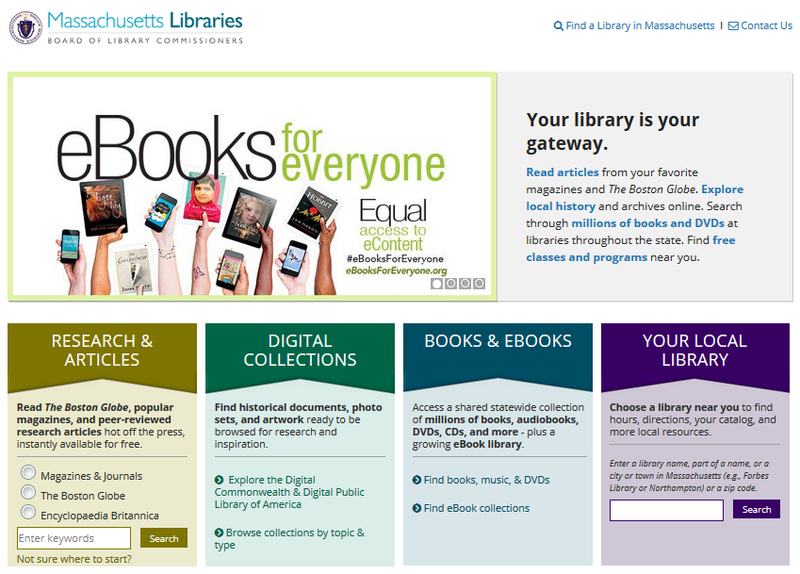 Libraries are essential in providing access to digital media that many may not have access to otherwise. They play a critical role in leveling the “digital divide” playing field. Libraries are worthy of our support and worthy of tax payer support. Our library is more than just a place to borrow materials...it is a hub of our community with a community room that is used every day of the year by over 150 different groups. It is a place where people come together to discuss common interests, meet up with friends, see/hear fabulous authors talk,etc. …It is also an essential resource for those of us whose work relies on access to accurate and up-to-date information; I use my local library’s services on a weekly basis, including interlibrary loan services, and would be hard-pressed to do my job as effectively without it. 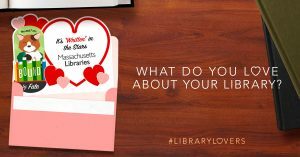 For more information on the Library Lovers campaign, contact Celeste Bruno at the Massachusetts Board of Library Commissioners. 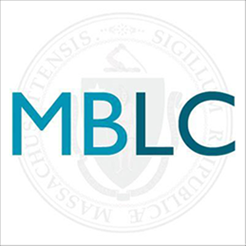 To be a part of the campaign, access all materials on the MBLC Awarehouse. Valentines are a way we show how much we care. 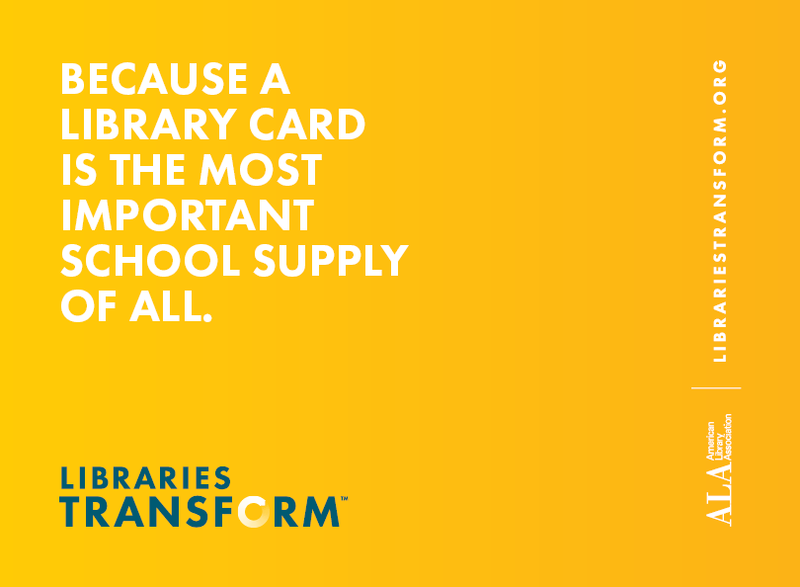 So why not use them as a way to show how much libraries are loved? That’s exactly what the MBLC has done. 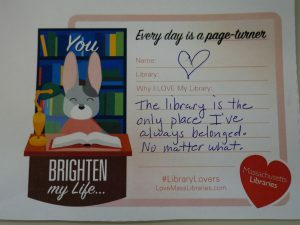 For two years, the MBLC has run Library Lovers, a campaign that provides a way for residents to write valentines to their libraries. The MBLC collects the valentines and delivers them to legislators to help them better understand how much residents value libraries. Last year 4,000 valentines were delivered to Massachusetts legislators. This year we’re still counting. The Director of the library helped me with research for a television show I was working on. Despite the fact that I now live in New York, there was no one I’d rather have spoken with; she, along with the rest of the Library staff, are incredibly well-informed, with excellent knowledge of the resources at their fingertips. My library supported me! I emailed them with an idea to start an environmental themed book club, and they helped me brainstorm which books we should choose for the program, took care of all the advertising and scheduling, and now I have this awesome book club to look forward to every month! I get to meet people in my community who care about the same things I do too. As a recent college graduate, finding ways to connect with my community after being away for 4 years is really important to me. I’m so happy I was able to continue learning new things with other like-minded people at my local library. I love our local Library because it brings our community together. It allows us to meet each other in person and share experiences…My library helps to make my retirement years meaningful. Our library is more than just a place to borrow materials...it is a hub of our community with a community room that is used every day of the year by over 150 different groups. It is a place where people come together to discuss common interests, meet up with friends, see/hear fabulous authors talk,etc.…It is also an essential resource for those of us whose work relies on access to accurate and up-to-date information; I use my local library’s services on a weekly basis, including interlibrary loan services, and would be hard-pressed to do my job as effectively without it. 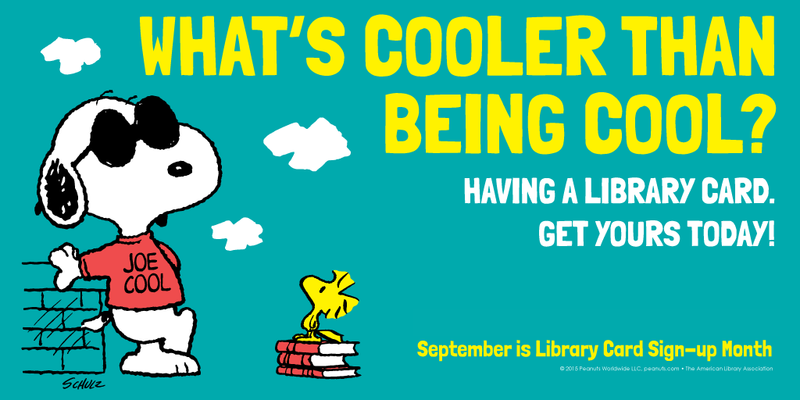 For more information on the Library Lovers campaign, contact Celeste Bruno at the Massachusetts Board of Library Commissioners. To me, one of the joys of summer is finding a good book and reading it on the beach. There is nothing quite like the warm air and bright sunshine to make reading extra enjoyable. What made it even better this year was helping to inspire children to read and avoid the summer slide while they were out of school, through our first ever “What’s Your Four?” campaign. Although I now enjoy reading during the summer as an adult, it was not always my favorite activity growing up, and I always needed a little encouraging. I was not alone. Many children and teens have a hard time reading over the summer, despite the academic benefits that it has been proven to give. In fact, teachers generally spend 4-6 weeks re-teaching what students forgot over the summer at the beginning of the school year. It has also been shown that having reading role-model parents or a large book collection at home has a greater impact on kids’ reading frequency than does household income, and that 92% of children and teens say they are more likely to finish a book that they picked out themselves2. Knowing all of this, we decided to do something this summer to try and get kids reading more. We challenged all residents to choose four books to read over the summer months in a campaign we called “What’s Your Four?” The idea was to encourage children, teens, and adults to read by having Massachusetts residents post four books that they chose to read to social media. It is four books because students who read four or more books over the summer achieve better on reading comprehension tests in the fall than their peers who read 1 or fewer books. In total, we had over 450 posts that used the hashtag #WhatsYourFour, and from these posts, we’ve compiled a list of the over 550 books that have been recommended by participants. These books range from cookbooks, to children’s stories, graphic novels, and biographies. We had responses from the Berkshires to Provincetown, and many local libraries and their staffs got involved to share what was on their reading lists. Modern Lovers by Emma Straub, about a group of college friends in New York City, who now have their own children going to college. A Man Called Ove by Frederik Backman, about a grumpy old man who warms up after a young family moves in next door. Harry Potter and the Cursed Child by J.K. Rowling, a sequel to the famous Harry Potter series, the book is the script to the play of the same name. The Nest by Cynthia D’Aprix Sweeney, about a dysfunctional wealthy family and its children’s inheritance. Massachusetts Politicos also got involved and sent over their summer reads. Boston Mayor Marty Walsh, Attorney General Maura Healey, Treasurer Deb Goldberg, Auditor Suzanne Bump, State Representative Jim Dwyer, Secretary of Education Jim Peyser, and New Bedford Mayor Jonathan Mitchell all shared four books to encourage children, teens and adults from around the Commonwealth to read. As the air starts to cool and school starts again, reading will shift for many from pleasure to academic. We hope that just how memories of the beach stave off the cold on a snowy January day, the memory of a good book will remind everyone of a great summertime, and will encourage them to continue reading throughout the whole year. 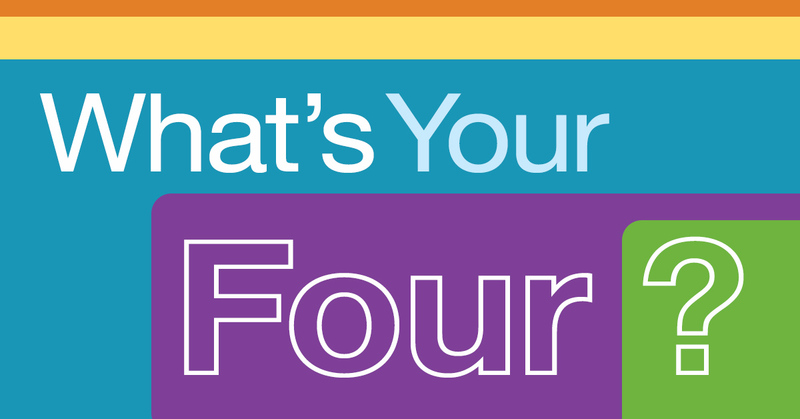 You can see a full recap of the “What’s Your Four” campaign here. Lasting Consequences of the Summer Learning Gap, Karl Alexander, Doris Entwistle, Linda Steffel Olson, April 2007. The Kids and Family Reading Report™ 4th edition conducted by Harrison Group and Scholastic, 2012. Format ImagePosted on October 3, 2016 April 8, 2019 Author Matt PerryCategories PromotionTags books, Literacy, summer reading, What's Your Four?